Adventure Hunting is your guide to adventure worlwide: China, Africa, South America, Australia. We now have a wheel chair friendly lodge which sleeps 4 disabled people. We have all the proper equipment, facilities and experienced guides to make sure your stay is comfortable and susessfull. The Lodge consists of a lapa/kitchen and four fully furnished chalets, gently sloping entry ramp, convenient low-placed light switches and a large, specially adapted bathroom with all the necessary amenities. The rooms are all level with adapted door widths and bed hights. We have over 30 000ha in which to hunt in this area. The veld is varied - rolling hills with deep kloofs, open acacia thornveld and dense bushveld and patches of open grassland. Gentle sloping ramps making the lodge totally accesable for wheel chairs. The bathroom is adapted with rails and support bar, at all the right hight. The hunters are loaded onto the back of the hunting vehicles with the aid of either a special lift or a ramp - depending on the chosen vehicle. Four helpers surround the lift platform at all times to stabilize the chair and assist in case something should go wrong. The lift is mostly used for people in heavy electrical wheelchairs or those who prefer not to use the ramp. We use different hunting techniques, this is usually dictated by the level of disability as well as the hunters preference. Walk and stalk and ambush: The hunter is carried into an ambush position in the portable chair by the 4 carriers. Due to the nature of the terrain disabled hunters usually have to make use of the ambush method but, where possible, 'walk-and-stalk' hunts are also conducted. In the hunting areas, many ridges overlook kloofs, gulleys and terraces and when hunters go after kudu, impala, blue wildebeest, mountain reedbuck or even Warthog, they are carried in the chair along these ridges early in the morning and/or late in the afternoon. We stop frequently to glass for game. 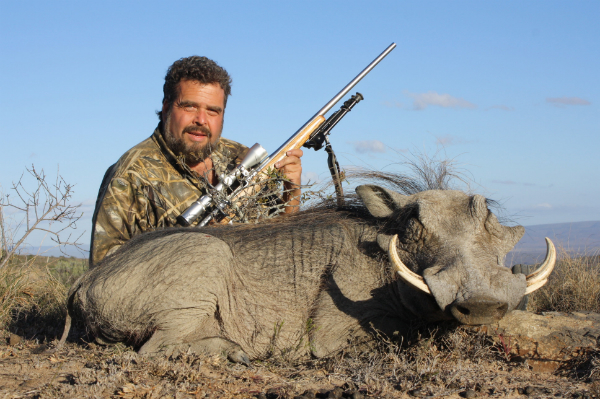 If the hunter cannot shoot from the spot, we work out an approach route and 'stalk' (carry him) closer to the animal. Quad Bike and Blind: We have ATV's which we drive around the bush, find a suitable site and sit out and wait for a shot. We also carry portable pop-up blinds that fit around the ATV. Additional animals can be taken at additional cost. Please see trophy list below. We have always believed that Africa should be experienced as a couple or a family. 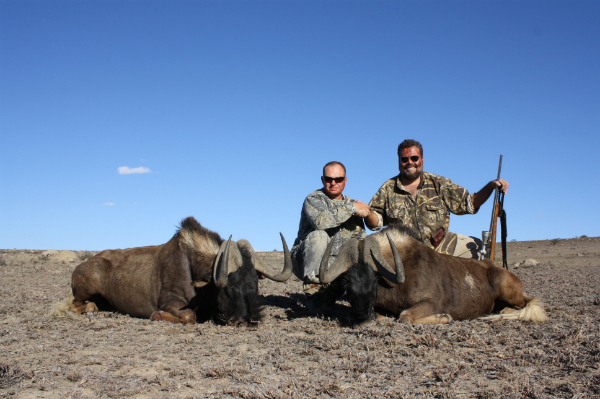 We have designed our lodges and maintain the private reserves that they are located on with your non hunters in mind. At each of our lodges you will find the highest standards of accommodation and cuisine as well as a good mix of wildlife for the overall African experience. On our properties we have just about every species of African animal right out your front door. This includes rhino, herds of buffalo, leopard and many species of planes game. Game viewing is often best right from the swimming pool! We also have blinds and observation areas set aside for those who whish to do photography and bird watching. The restoration efforts on our properties have led to an abundance of flora and fauna. There is always something going on in the bush! With us non hunters are also always welcome out on the hunt. 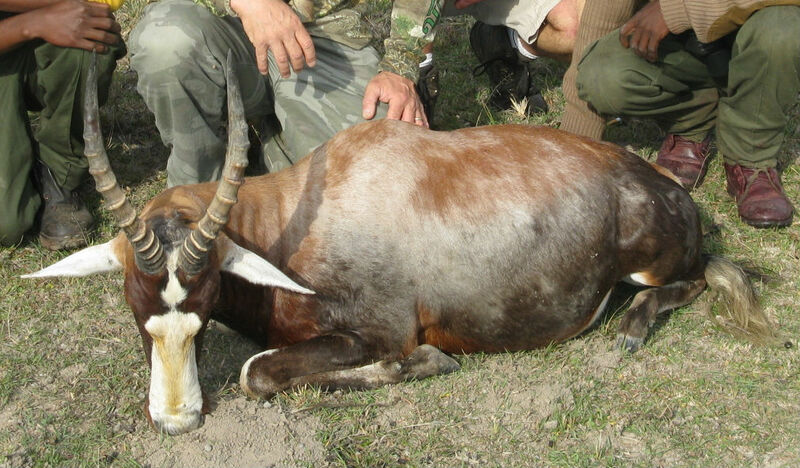 Remember this is your private hunt with private guide and vehicle. Many of the ladies will accompany us in the bush and become part of the team helping spot animals and recording the hunt on video or in pictures. (Through the years we even have had a number of non hunters take their first animal with us!) We also realize that this may not be for everyone. One great advantage we have is that our lodges are not located hours out in the bush completely away from civilization. While our hunting areas are far away from the towns we are not that far away that we can pop in for a visit! Most of the activities listed below are within an hours drive or less from one of our lodges and they make excellent day trips for the non hunters. We can also organize pre and post hunt itineraries for the entire group such as Cape Town or Victoria Falls and Chobe. Contact us for details. Below we have some of the many additional non hunting activities that we offer from our lodges. At many hunting lodges the ladies find themselves isolated out in the country with nothing much to do during the hunting days. This is not the case with us! Our hunting area is unique in that we are not located out in the countryside hours away from towns and civilization. We can offer many activities from classic photo safari to golf and even skydiving! All of this and more can be found a short drive from our lodges. We have always believed that Africa is to be experienced as a family. This is one hunt were the non-hunters have more fun then the hunters! While you are off stalking game your non-hunters will be on the holiday of a lifetime. Below is a short list of possible options. If you have other interests then please let us know and we will design a program just for you! 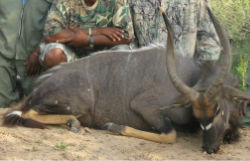 Day trip to Pumba Private Game Reserve: $150.00 per person with transfers. Pumba is located approximately 40 minutes from our Kudu lodge. This magnificent private reserve offers outstanding viewing of the big five as well as many other species. Safaris will be conducted in open safari vehicles and are led by expert game rangers. This day trip will allow you to experience a classic photo safari with knowledgeable rangers who will provide in-depth information on the flora and fauna. Simply a must do during the hunt! See the Eastern Cape�s famous pachyderms at peace and at play in the thickets of the unique Addo Valley Bushveld. Along with a wide variety of other bushveld game, Addo�s bush provides refuge to these gentle giants, descendants of the former vast herds of elephants that once roamed freely in the area. The Park is sanctuary to some 350 Elephants as well as buffalo, Lion, Black rhino, plenty of birds and several species of antelope. Lion were reintroduced about two years ago and sightings have been good. After your game drive enjoy a light lunch at the Addo Elephant Park Restaurant. Scenic private transfer to the seaside community of Port Alfred. Here we have a great day spa that offers all manor of relaxing treatments. Lay back and enjoy! Be pampered for the day and emerge renewed and refreshed!! The Grahamstown Golf Club was founded in 1891. Membership had reached 35 by 1902 and was up to 101 by 1906. It reached an all time high of 609 in 1990. A traditional course layout set amongst hills, dunes and coastal indigenous bush, East London Golf Club has a combination of both links and parkland features. The course is also home to a family of impala, resident on the course, the Knysna Lorie and other species of bird life. Our local 18 hole Golf Course set just outside the town of Komga, 20 minutes drive from Kubusi Lodge. Visit Grahamstown and follow in the footsteps of the 1820 settlers. The broad tree-lined streets and imposing public buildings are the legacy of a time when Grahamstown was the Cape�s second most important city. Visit the oldest official letter box in SA, the Natural Science, History & Observatory Museum, SA Institute for Aquatic Biodiversity and the 1820 Setters National Monument. No tour is complete without a visit to the spectacular Grahamstown Cathedral. The National Arts Festival held in July every year celebrates the best in South African and imported talent and regularly attracts more than 30 000 festoons who come to enjoy more than 500 shows � everything from opera to jazz and comedy to drama � as well as a huge diversity of other creative disciplines. Depart for Kenton-on-Sea (you could choose to incorporate a horse ride along the beautiful coastline) swim in the warm waters of the Indian Ocean, take a stroll up the magnificent beach, then pay a visit to Port Alfred, this historic little coastal town lays on the Indian Ocean and straddles the glorious Kowie River an ideal place to purchase your curios for back home. A short drive from Port Alfred is Bathurst Village, picturesque, rustic and reminiscent of England's Cotswolds, this town is known for its gracious old buildings and huge oak trees. In Bathurst you�ll find the world�s biggest pineapple, the toposcope where you can view how the land was divided by the 1820 settlers, St John�s Church, the incredible views at Horse Shoe Lookout and the old mill. Visit the Bathurst Agricultural Museum which is a tribute to the 1820 Settlers� courage and entrepreneurship. Enjoy a tranquil lunch at the Pig & Whistle, South Africa�s oldest pub. The Bay of Port Elizabeth is located on the southern-eastern coast of Africa along the shorelines of Algoa Bay, the city dates back to arrival by sea of 4 000 British Settlers in 1820. Shopping - From �Market style� shopping, to craft shopping at different flea markets, to up market boutique and mall shopping, you will find exactly what you need. Bayworld � Situated on the beachfront you can sit back and relax and meet the dolphins - Dolly and Domino - and seal presentations hosted at the Oceanarium. The Snake Park houses a wide variety of exotic and indigenous snakes as well as an impressive variety of Eastern Cape Reptiles. The museum includes natural and cultural history artifacts � shipwrecks, dinosaurs and much more. Situated just outside of Kenton-on-Sea enjoy riding alongside the dunes and on the beach beside the gentle Indian Ocean. Be on the lookout for dolphins and whales that often pass through these waters. Perhaps incorporate this outing with your Bathurst Village and Kowie River Safari. This makes a great day�s outing. National Park consists of an area of 20 780 hectares and forms part of the Addo Elephant National Park. Zuurberg consist of 5 different vegetation veldt types the Alexandria forests, subtropical thickets, grass-like fynbos and grasslands. These veldt types are home to number of endangered plants, the Alexandria forest consists of evergreen trees with a canopy that varies from 10-14 metres. In these forests a large variety of bird life is found. Choose the one, three or five hour trails and enjoy the exceptional scenic beauty and diverse vegetation. With abundant game (mountain zebra, klipspringer, kudu mountain and grey rhebuck to name but a few) and a myriad of birdlife, you�ll be sure to experience Africa in a way not easily forgotten The Zuurberg mountain trail provides you with a unique experience and horse trails are undertaken on well schooled, very sure-footed Basuto pony/Boerperd cross-breeds. Your experienced and well informed guide will be close at hand to answer all your questions. All the necessary riding gear is provided. Horse ride through our reserve viewing game close on horse back. White Rhino, Buffalo and many species of antelope make an exciting ride through the valley bushveld. Exploring some of the deep ravines also makes an exciting time flushing out warthog and secretive Kudu Bulls. From our jump club in Grahamstown. We've been back since Tues, Aug 12. We had a fantastic trip; the hunt was great. I got gemsbok, impala, springbok, bushbuck, and blesbok. Brian shot kudu, wildebeest, impala, bushbuck, and blesbok. Brian is psyched and ready to go again. Our PH is a great hunting machine! The entire trip minus the flight over and back was A++++++. If you ever need references, have them contact me. Thanks again for making all of this possible. Buffalo: 2 Days $700-00 per day. Lion: (Captive Bred and released): 2 days included. Trophy Fee from $17 290-00 to $50 000-00. Lioness (Captive Bred and released) :Trophy Fee $5500-00. 2 x days at US$300 per day. 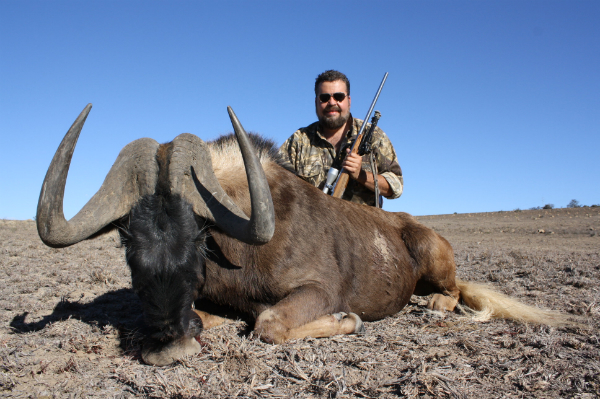 � Field preparation of trophies and forwarding them to a taxidermist or shipping agent of your choice. The question of taxidermy always come up with any hunting package. We have our own in-house taxidermy shop that you will be able to visit on your hunt. It is located at our Kudu Lodge. We only work on animals from our hunters and do not take in outside work. Your trophies never leave our possession so we are able to supervise them at every stage of the taxidermy process. There are two basic ways most animals are processed. First you can have the animals dipped, packed and shipped to your taxidermist back home. This process brings the completely dried hides and cleaned skulls to your facility were the maintaining process will begin. It takes around 3-4 months. The second option is to have the animals mounted by us and then shipped directly to you. This process takes between 9-12 months. Trophies are ready to go up on the wall when they arrive. Which ever option you choose we have a logistics firm that will handle all the shipping and paperwork for the process so you will not be bothered with all the details. Prices below are for the taxidermy services ONLY and do not include the crating, shipping, brokers, etc. You will get a final quote on these services once the animals are ready to ship. As hunters ourselves we realize how important the taxidermy process is to the overall experience of the hunt. Having our own facility to process your trophies allows us total control over the entire hunt so we can assure our clients nothing but the best in quality and service! Feel free to call us with any questions at any time as well as for updates on your mounts. Unlike many others where you would be dealing with a taxidermist who you never met and who can be difficult to get a hold of in a different country, you can call us any time and we will answer questions and be able to get updates on your trophies as well as be at your side during the shipping process. I just wanted to let you know that I received my animals yesterday afternoon and everything made it in great shape. I was very impressed how everything was wrapped in bubble-wrap so that nothing could get rubbed or damaged. Opening that crate was kind of like Christmas morning and opening all the presents. I can�t wait to get started on my mounts but will have to wait for a while until I get everyone else�s stuff done. I am seriously looking to come over again in 2012. I would really like to make it a late April � early May hunt again. It seemed like that timeframe was very good for hunting and the weather. I will keep you posted. I am working on several friends and family to come over with me this next time. I keep telling them it is a hunt unlike anything you will ever get from a hunt around here and will be at the top of the list of hunting experiences they will ever have. I had the best time ever hunting South Africa. Allen is a fantastic PH, I really enjoyed hunting with him. Allen put me on some fine trophys. Every thing was just as you said it would be. I was treated execptionally well by every one. I love Africa and can't wait to go back. We hunted hard every day and Allen made sure I took all the game I was after and then some. I can't say enough about what fantastic PH and host Allen was. When I tell my hunting stories to customers, they want to know who I hunted with. I am highly recomending you. You should sent me cards and hand outs that you take to shows. I will be glad to send my customers to you. I just had the best time. I took around 2500 photos. Thanks Ed, the hunt was outstanding. Here are some photos, I will be happy to send more if you like.